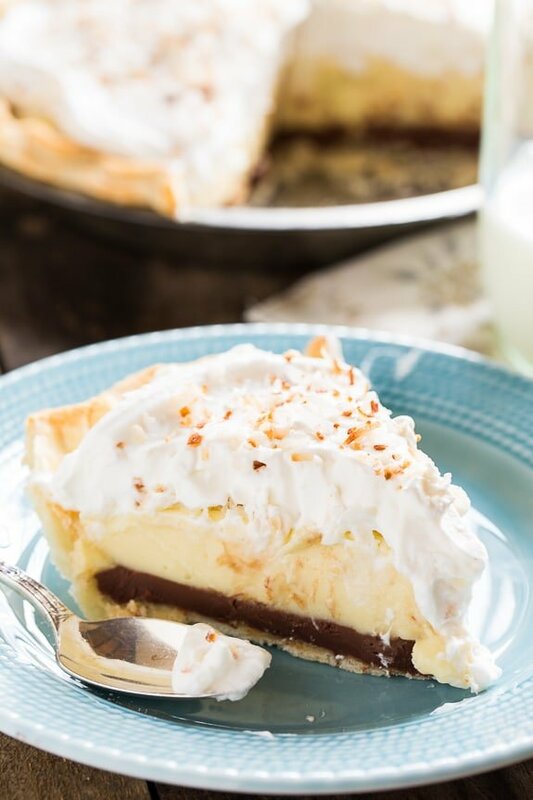 Black Bottom Coconut Cream Pie has three delicious layers and tons of coconut flavor from coconut milk and shredded coconut. Happy Easter! Except for Carrot Cake, I don’t really have a dessert that I associate with Easter. Maybe Hummingbird Cake and Pineapple Upside Down Cake too. I can tell from my blog analytics from the last few days that lots of people will be enjoying Banana Pudding Cake for Easter. Do you have a favorite dessert recipe you make for Easter every year? Recently I’ve been obsessed with all things coconut. Which is strange because coconut is something I hated for most of my life. I desperately wanted to like it because my coconut aversion was causing me to miss out on way to many good foods. Samoa cookies and Pina Coladas warmed me up to coconut and the more I ate it, the more I liked it. Now I can’t get enough. 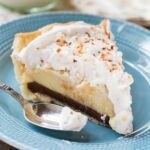 So I saw this Black Bottomed Coconut Cream Pie in Taste of the South – my favorite magazine for southern recipes. Any time you add chocolate into the mix, things can only get better. It has 3 layers but it uses a refrigerated pie crust to make things a little easier. Of course you could use a homemade pie crust and it would be even better. Except for baking the pie crust, no oven is needed. 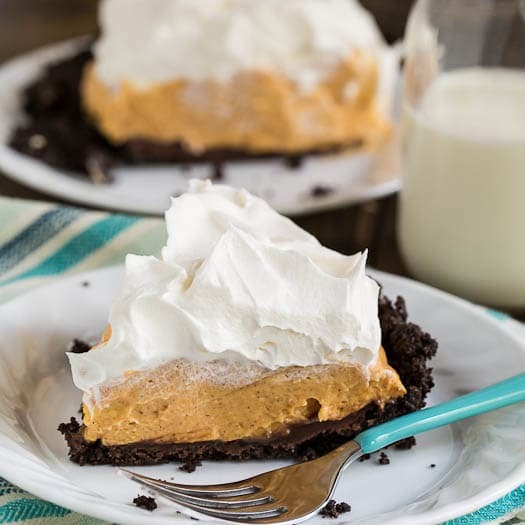 I think this pie would even be good with one of those pre-made graham cracker crusts and then it would totally be no bake. The first layer is a chocolate layer. I used semisweet chocolate instead of the bittersweet the recipe called for because my kids vehemently object to bittersweet chocolate. They’ll eat semi-sweet chocolate, but even with that they say milk chocolate would have been better. Sometimes I agree, but in this case it is nice to have a strong chocolate flavor to contrast with the taste of the coconut. The middle layer is a coconut custard flavored with shredded coconut, coconut milk (the kind you get in a can), plus some coconut extract. Coconut extract can be hard to find. I ordered some from Amazon and after reading the reviews, I actually decided that an Imitation Coconut Extract was the way to go. 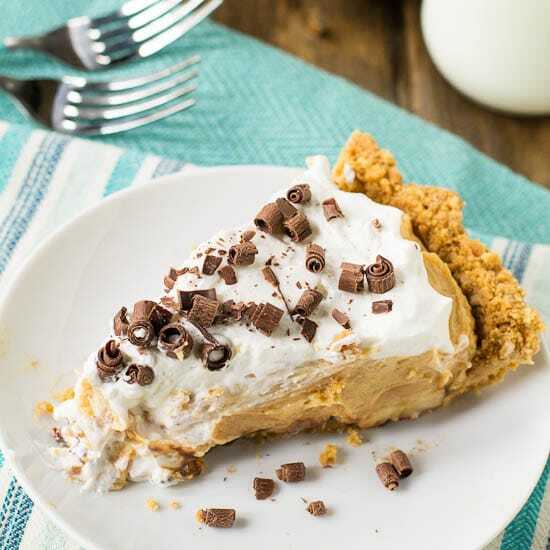 In all honesty though, this pie would still be delicious and have plenty of coconut flavor if you left the extract out. 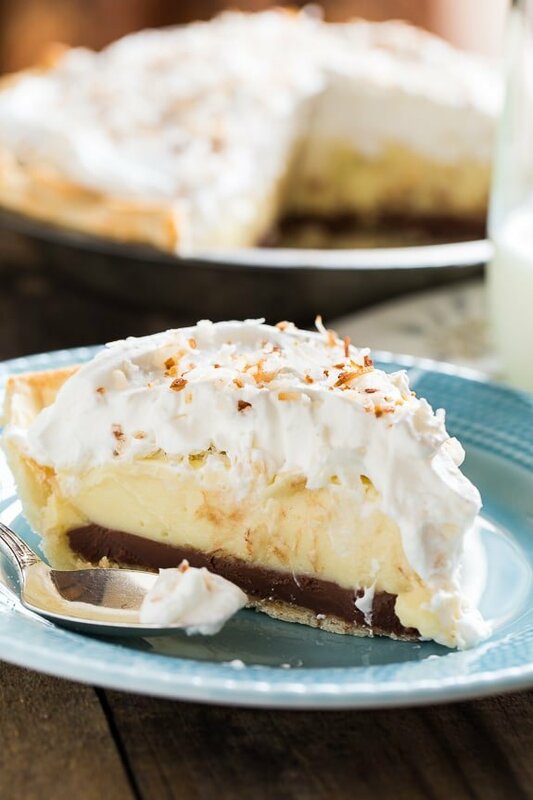 With a thick layer of coconut flavored whipped cream on top, this is one creamy dreamy pie perfect for warmer weather. If you’d like you can make a Homemade Flaky Pie Crust for this recipe. Watch the video below to see how easy homemade pie crust can be. Preheat oven to 425 degrees. Shape refrigerated pie crust in a 9-inch pie plate. Fold edges under and crimp. Prick bottom and sides of crust with a fork. Bake until light brown, about 10 to 15 minutes. Let cool completely. To make chocolate layer, place chopped chocolate in a medium bowl. Bring 1/2 cup heavy cream and the butter to a boil in a small saucepan. Pour over chocolate and let sit 30 seconds. Add 1/4 teaspoon vanilla extract and whisk until smooth. Let cool 5-10 minutes and then pour into prepared pie crust. Place in refrigerator. To make custard layer, whisk egg yolks and sugar together in a large bowl. Whisk in flour, salt, and 3/4 cup coconut milk. Bring milk just to a simmer in a medium saucepan. Very gradually (to not curdle the eggs) whisk the hot milk into the egg mixture. Once all milk has been whisked in, pour the whole mixture into the saucepan. Cook mixture over medium heat, whisking constantly. Once the mixture starts to bubble, keep whisking until it is thickened, about 2 to 3 more minutes. Remove from heat and stir in 3/4 cup shredded coconut, coconut extract and 1/2 teaspoon vanilla extract. Pour custard mixture into a medium bowl and place this bowl inside a large bowl with ice in it. Stir mixture occasionally. Once it has cooled for about 20 minutes, pour it into pie crust. Place plastic wrap on surface and refrigerate overnight. To make the whipped topping, beat 1 cup heavy cream, 1/2 cup coconut milk, and confectioners' sugar on high with an electric mixer until stiff peaks form. Spread over custard layer. Top with toasted coconut. Store in refrigerator. You can usually find canned sweetened coconut milk in the Asian section of the grocery store. When you open the can, it will be solid on top and liquid underneath. Pour the whole thing in a bowl and whisk it. You don't need to whisk it until smooth, but you do want it to be fairly uniform. One can is enough for this recipe. You will use part of it for the custard and part for the whipped topping. This entry was posted in Desserts, Pies and Tarts and tagged coconut, pie. Bookmark the permalink. I made this pie today. Everything was going well until I made the whipped topping. The heavy cream and coconut milk separated themselves during the whipping process and a final whipped product was never made. I had to throw it out. I recommend making a regular whipped cream recipe and add a bit of coconut extract instead. Coconut 🥥 obsessed too. Cannot wait to try this and their coconut macaroon pie recipe. This recipe just stopped me in my tracks as I was pinning along this morning. Absolutely stunning, and I have got to try it. 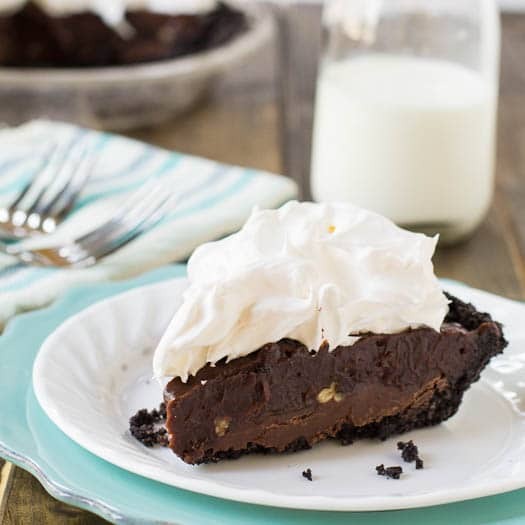 I’m a coconut-obsessed gal, and I just love that you’ve put a chocolate bottom on the pie. brilliant! Sounds pretty easy to make and really yummy! I wasn’t always a fan of coconut either but now I can’t get enough! Love this pie! The semi-sweet chocolate layer sounds amazing with all the coconut! I LOVE that you added chocolate to this! That rich creaminess paired with the toasty coconut and the smooth chocolate sounds amazing! Oooh coconut pie!! This looks so magical Christin! I must try making this. OMG!!!! I love how this looks! I LOVE this pie!!! And I must agree that semi-sweet was the way to go…sometimes bittersweet is just too much. Especially with delicate flavors like coconut. And your comments about coconut extract are funny because I have been trying to find coconut extract for over a WEEK! If I had known it would be this difficult to find, I would have just bought it on Amazon like you! I could seriously stuff my face with this cream pie. 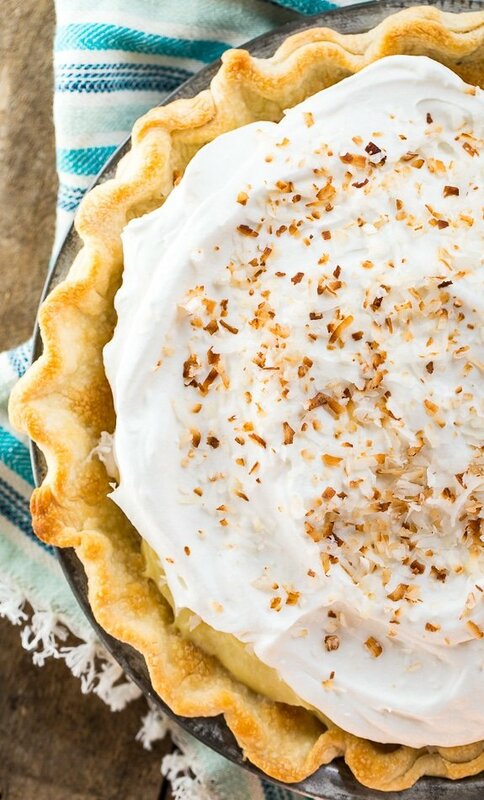 I love coconut anything and never had a coconut cream pie before! This is something I absolutely must try! Pinning! Okay seriously, this is the best of both worlds. That beautiful cream layer and the chocolaty bottom <3 Looks amazing! I think I have always loved coconut. There aren’t many desserts I turned down since I was a child! Lol. Now I am totally obsessed with it. This pie looks amazing!